An introduction to the function of the article. Adjectives, comparatives and superlatives for 5 adjective forms. 63 Command cards for the Detective Adjective Game. Sentence strips that will encourage independent work while consolidating the knowledge of the function of words. 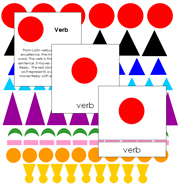 Use these symbols to visually analyze each word within a sentence. A physically concrete way to introduce the noun and verb. Sort photographic cards into person, place, or thing. Match opposites using words and pictures. Learn the rules of plural words. 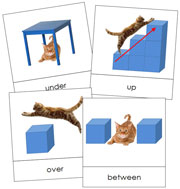 Assists children with understanding the correct meanings of prepositions. 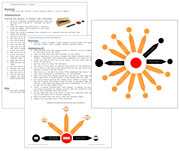 Detailed instructions, diagrams, full set of arrows, circles, triangles and control charts.